I have a scoop that has accidentally gone through the dishwasher a couple of times without apparent ill effect. Is there now something deficient about my scoop? Is it not being as effective as it was when it was new due to the lack of some mysterious chemicals? Is the finish now coming off into my ice cream even if I can't see it? Is there any health or safety risk due to this? I've accidentally run my scoop, a Zeroll with conductive fluid inside the handle, through the dishwasher. I don't know this for a fact because I didn't cut mine open to check, but I believe what happened to mine (and what's happened to yours) is that the fluid is meant to work at normal body temperature and when it gets too hot, like in a dishwasher, it solidifies. That's the clunking sound, the now-solid conductive liquid. So while it still works as a scoop, the conductive fluid is no longer doing its job and scooping will be a little harder. I definitely noticed that after mine went through the dishwasher. Is the liquid inside the handle? Some ice-cream-scoops are hollow and have a liquid on the inside to help heat conduction - this helps melt the ice-cream and prevent it from freezing to the scoop. Note that it mentions: "Heat conductive fluid inside handle"
If it's filled with a liquid, the extreme heat of the dishwasher might cause it to rupture. 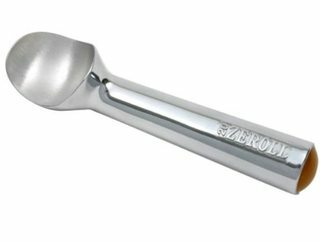 If you have a scoop that's aluminum or stainless-steel and not chrome-plated steel, you're probably fine regarding the finish of the scoop. One reason could be that dishwasher detergent significantly affects aluminum items. I learned early on that aluminum pans lost their shine and had a dark residue on the surface. Not 100% sure, but it seems like oxidation. With a good cleaning the shine can be restored. However, I no longer put any aluminum items in the dishwasher and no longer deal with this problem. The Zeroll isn’t dishwasher safe. Often you’ll see that fact associated with the heat conducting core of the scoop, but that’s not really the culprit. The folks at Zeroll were able to explain a bit to me about how the core of the scoop works, and why it isn’t dishwasher safe. According to Zeroll, the fluid is a “non-toxic, safe, water-soluble oil”—not antifreeze, as some people suggest. The reason you can’t put it through the dishwasher is actually because of the aluminum body, which is apparently “due to the caustic material in the dish detergent that will oxidize/tarnish the aluminum. 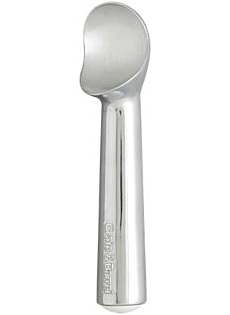 Incidentally, that brand of ice cream scoop won not only the the top rating on that site, but also of Cook's Illustrated/America's Test Kitchen. In 1983 I had my 1st job at Braum's in Bartlesville store # 13. They are numbered in the order they were built. Anyway I asked that same question back then and the assistant manager told me they have mercury in them and mercury when heated up sweals . I not to sure how true that is but it could explain the warning though . It's just way dangerous in my opion . Mercury in the smallest amount in our bodies can kill US like super fast . Seems a little crazy to have mercury in it. I recently bought a scooper and asked the manager about it and he said he didn't know what was in there but felt like I did about it that they wouldn't needlessly endanger lives like that. I am curious to that's how I come apon this question that we both have. Will be looking further into it . Will let you know if I find out the big mystery. I ran my girlfriends pampered chef scoop through the dishwasher this week. It went in looking like aluminum. It came out gray and covered in a gray fine powder that I couldn't wash off. A lot of it came off on my skin when I was handling it and it was hard to wash out. I gave up trying to clean it and now I'm trying to find a new one. The white plastic cap at the end is stained a gray color and the whole scoop is scratchy feeling. Not the answer you're looking for? Browse other questions tagged cleaning ice-cream utensils or ask your own question. Is heated up bleach dangerous?